NutrInflow | For cleaner sea! The project NUTRINFLOW aims at reducing nutrient losses from agriculture to the immediate watershed and into the Baltic Sea. The idea is to take practical actions for holistic drainage management for reduced nutrient inflow to the sea. This is done by implementing, demonstrating and increasing the recognition of innovative water management measures in agricultural areas. The project activities focus on pilot areas in Finland, Latvia and Sweden under pressure by agricultural nutrient losses. The project implements targeted demonstration investments to the fields and to the drainage network in cooperation with municipalities and farmers as the main target groups. Through the investments, the project expects to reduce nutrient losses from agriculture in three priority regions. Because of the project, the nutrient inputs to the Baltic Sea will be decreased whereas the attractiveness and feasibility of holistic water management approach for agricultural catchments across the Central Baltic Region will be increased. Overall, the project connects local authorities and farmers in a unique way and demonstrates a cross-sector approach in sustainable agriculture and management of ecosystem resources. NUTRINFLOW is the first full-scale project under the EU Strategy for the Baltic Sea Region flagship project “Flow Baltic” through which it will gain region-wide visibility. Our common Baltic Sea suffers from eutrophication caused by nutrients of human activity. We have to protect what has been given and preserve it for further generations! The project NUTRINFLOW has a clear vision and belief that our activities will result a cleaner sea!! The project will demonstrate the benefits of a holistic view of drainage management for reducing nutrient inflow from agricultural fields to the Baltic Sea. The projects main target groups are farmers and other landowners, but also authorities on local, national and multinational level. Specific measures are primarily drainage and retention related measures, which are included both in the Programmes of Measures Water Framework Directive River Basin Management Plans and in most cases in the Rural Development Programme. The relevance of reducing nutrient loading through agricultural drainage infrastructure is well understood. The best results can be achieved with an holistic approach: from the very beginning until end – from the field up to water bodies and eventually to the Baltic Sea. Nutrient inflow to water begins from the fields. The project will provide solutions for balancing nutrients, water management, retention capacity, soil structure, field levelling as well as surface runoff. Key point is to improve water drainage network. In many cases, they are outdated and in need of renovation. Solutions provided by NUTRINFLOW are lime filtration drainage, drainage flow management / controlled drainage, sub-surface irrigation. In order to achieve the best results, work has to be done also on environmental water management: artificial wetlands, sedimentation ponds, bottom thresholds, dams and other solutions. Other environmental aspects will be also taken into account: biodiversity, scenery, fish migration, recreation, tourism. The project brings together scientists, farmers, planners and technical consultants, technology developers and local authorities within local innovation groups. To achieve our goals, they search for practical and low cost innovations that can be used for flow and nutrient management. 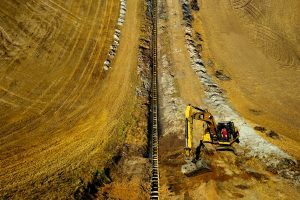 These can be innovations for environmentally friendly ditch clearing, two-stage ditches, bottom dams, sedimentation ponds, wetlands, adapted and integrated buffer zones and controlled drainage. By utilizing the existing drainage system structures and improving drainage technologies as well as production on fields, we can reach better nutrient balance – less nutrient losses to waters. The project aims to establish good practical examples of win-win measures for agricultural producers in water management for the retention of nitrogen and phosphorus. Through working with farmers and land owners, the project promotes and demonstrates with concrete investments the benefits gained from holistic planning and coordinated implementation of water retention and on-farm drainage management measures. We have chosen pilot territories where contemporary solutions will be implemented. Loviisanjoki River catchment area in Finland, Lielupe River catchment area in Latvia and Vadsbäcken river catchment on Norrköping region in Sweden in few years will serve as examples of good practice for many farmers and environmentalists. The demonstration cases aim to stimulate further action in holistic measures against diffuse nutrient losses. By implementing demonstration investments, the project will lead to reduced nutrient input to the Baltic Sea from the pilot areas and the team believes that this will only be the beginning when these examples will encourage other farmers and even policy makers to follow! Our vision can come true only if others receive the knowledge and knowhow. A synthesis of knowledge will be compiled and disseminated transnationally, under the EUSBSR PA AGRI Flagship FLOW Baltic. By spreading the good examples across the Baltic Sea Region, NUTRINFLOW will increase the municipalities, landowners and policy makers awareness in water management measures to enable sustainable and long term strategies to reduce diffuse source nutrient losses to the Baltic Sea while maintaining viability of agriculture and improving the landscapes. In all pilot areas the project meets the existing needs of water flow regulation and enhances the implementation of the WFD River Basin Management Plans. NUTRINFLOW supports a holistic water management process on the local level and improves the stakeholders knowledge on measures and methods by international exchange. As a result, the project aims to lead to reductions in nutrient inputs to the Baltic Sea and to have increased attractiveness and feasibility of holistic water management approach for agricultural catchments across the Central Baltic Region. By cooperating with our neighbors, we can tackle many challenges and make the region a better place. The Baltic Sea region is a region with many opportunities. Our lead partner ProAgria Southern Finland gathered probably the best partners from Finland, Latvia and Sweden! In the first call of INTERREG Central Baltic Programme 2014-2020 42 cross-border cooperation projects have been approved for funding and contracted. Six of them in our priority “Reduced nutrients, hazardous substances and toxins inflow into the Baltic Sea”. Here are our friends! Whether you are looking for answers, would like to solve a problem, or just want to let us know how we did, drop us a line! We will try to help you or improve our job!